Honey provides a good source of glucose and fructose, and is produced by bees from the nectar obtained from various flowers. Bees go from flower to flower collecting nectar which is a solution of water, sucrose, glucose and fructose. Enzymes in the bees' body convert the nectar into glucose and fructose. Honey can often be used as a substitute for Sugar and is available in liquid, granulated, comb, chunk, and whipped forms. Choosing: The color and flavor of honey differ depending on the bees’ nectar source. There are more than 300 unique kinds of honey in the United States, originating from different floral sources as Clover, Eucalyptus, Berries and Orange Blossoms. In general, lighter colored honeys are mild in flavor, while darker honeys are usually more robust in flavor. Honey comes in many forms; whipped, liquid, crystalized and combs. 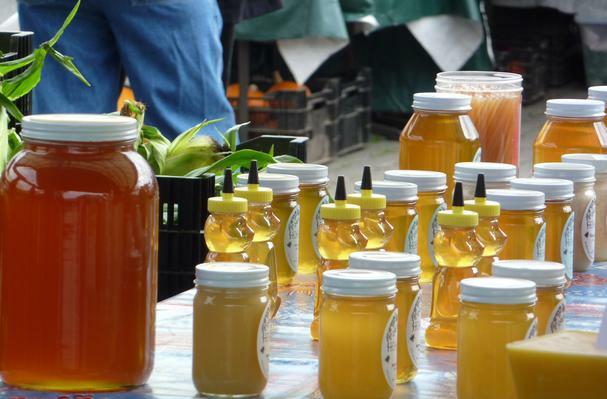 Buying: Honey is available through any grocer, but look for unique honey flavors available at your local farmer's market. History: Honey goes a long way back in history. Ancient civilizations have already used it as a sweetener or for medicinal values.